This is Scooby. He is an English Springer Spaniel [working variety]. Scooby and I share the same house. He tends to accompany me everywhere, except when I am playing the trumpet. 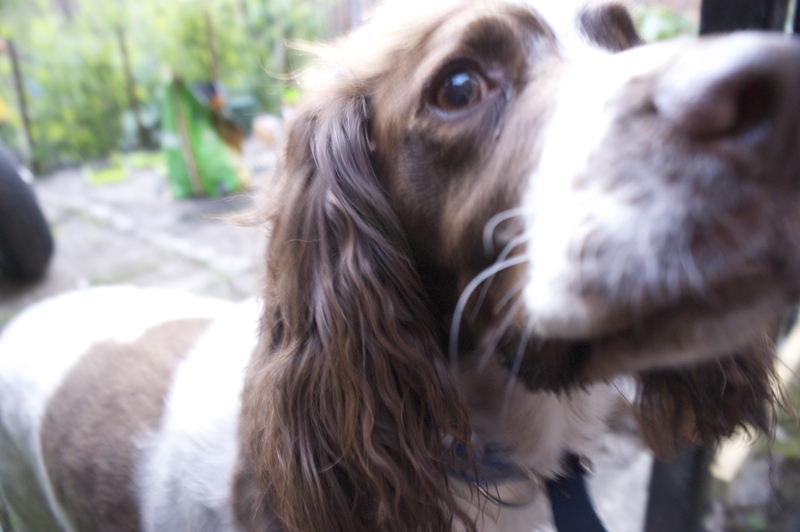 Scooby came to me at fifteen months old from the North West Springer Spaniel Rescue Centre near Warrington. He had been a police dog briefly and I made my contact with him via the police. The police ‘dog section’ train the ‘sniffer’ dogs in the auditorium at Philharmonic Hall. The Sergeant tipped me off about Scooby going back to the Dog’s home. He has become quite a celebrity here in Liverpool; welcomed into many pubs and has appeared in many newspaper articles, journals and is in demand for publicity shots for many retail establishments about town. Beautiful Dogs – thanks for sharing and rescuing Scooby. Springer Spaniels can be a wonderful addition to any home. If you get a field version be prepared to exercise a bit more than the show breed, but both require daily exercise. Springers make great family or hunting dogs.